Yesterday, we tried to run a diagnostic digest of the Sense + Intron hpRNA. The gel did not work properly, so we are redoing the gel today. We'll also go ahead and ligate antisense parts into all 38 minipreps that we HOPE contains correct Sense + Intron. 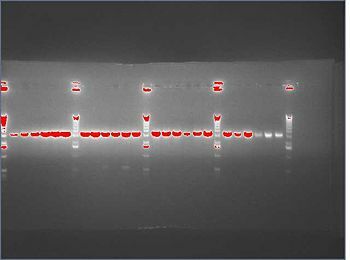 Once the gel finishes running, we can go back and dispose of the ligations today that do not contain the correct S+I parts. Today, we are also going to redo the ligation of Sense + Intron for PDK colonies because the gel that we are redoing today suggests that no PDK worked from last week's ligation. Rerun of the lanes that were ligations of PDK + sense because they did not show on the gel above. 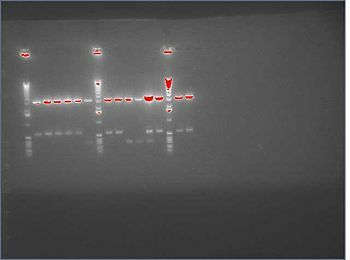 We feel that there might be a chance that if the Sense+PDK assembly did not work, the 300bp evidence ran off the first gel. 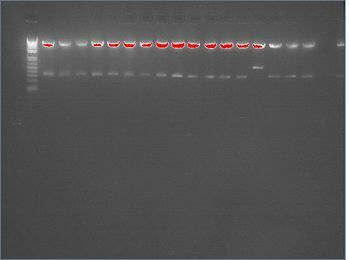 This second gel shows that most of the PDK+sense did NOT work. Only three worked -- minipreps 16, 30, and 31. Digested antisense parts with X, P and pSense+Intron with S, P. Digestion ran for 2 hours, with an additional 20 minutes to de-phosphatize the backbone. Ligations were done for colonies that showed correct Sense+Intron ligations. The standard Turbo Cell transformation protocol was followed. Since the gel showed that most of them did not work. Digestion of pLTP, pBet v1, and pGer 3 with S, P to prepare them as a back bone. Phosphatase was used. Did not digest pBet v2 because there was not enough. 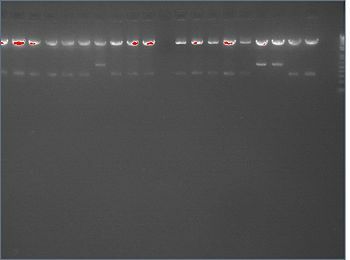 PCR purify the digested backbones containing Sense. Digestions were run on a 1% agarose gel at 125V for 30 minutes. 6 colonies of each are inocculated, except for Barn1 and Barn2, of which 4 are innocculated each. The same is done in LB+Kan for pLAS and Act2lacO promoter, which are Kanamycin resistant. This page was last edited on 26 September 2017, at 19:21.